Characters in popular fiction often remain long in the public consciousness because they accurately reflect archetypes that inform our everyday experience. The leading trio of men from the original Star Trek series show us this phenomenon clearly. Captain Kirk is a Mars/Aries personification: brash, aggressive, and direct (Kirk actually is an Aries with Mars conjunct Sun). Doctor McCoy is Saturnine: dour, practical, and efficacious. The commitment not to intelligence in general (Mercury), but specifically logic: the ability to accept or reject premises solely on the basis of empirical consistency with known truths. The utter lack of superfluousness and "small talk": everything a Vulcan says is significant to the situation at hand. This is not a Mercurial trait -- yet Saturn doesn't entirely fit because Vulcans have zero difficulty communicating when appropriate. The suppression of emotion in everyday life, yet the creation of cultural mechanisms for allowing emotion to run free at specific times. Not quite a Saturn thing because Saturn usually expresses himself as a constant unconditional pressure rather than an intelligent on/off switch. A total commitment to non-aggression and peace... co-existing with superior physical fighting ability and technique (the "Vulcan nerve pinch"). Nothing in the standard astrological playbook explains this. The "Vulcan mind-meld", or the ability to completely and perfectly transfer information from one mind to another. Neptune is certainly involved in this concept, but in Star Trek it generally happens without spiritual undertones: a bit like copying a hard drive. The portrayal of this ability seems to take it out of the realm of Neptunian mysticism into a type of science. Complete lack of ego and self-importance. One might be tempted to look to Neptune for this, but we've all seen extremely Neptunian individuals who are also extremely egotistical. Artists and politicians come to mind. Willingness to sacrifice one's own life, without hesitation, when it logically serves a greater end. As we've explored before, not quite the Neptunian trait one would think. Vulcan: Spock's race and home planet are named after a Greek/Roman deity who was an armorer, turning raw materials into tools and weapons. The 1960's: the era in which Spock came to be boasted a mass public awakening in the consciousness of peace and civil rights. The standard planets don't offer a satisfactory explanation for these traits. Pallas easily does. Her astrological nature reflects all of these points, from the emphasis on logic and self-discipline to the insistence on non-aggression and the deprecation of one's personal importance. The planet "Vulcan" suggests by its name the Palladian ability to "weaponize" raw materials. Even the psychic "Vulcan mind-meld" reflects the mythical Pallas Athena's way of leaving a lasting mark on her world: not through children but through the passing of knowledge and wisdom. If Kirk is Mars and McCoy is Saturn, Spock is not Mercury or Saturn, but Pallas. Coincident with the rise of Palladian (also known as "libertarian") ideology in the world of the past few decades, Spock may well be the clearest avatar of Pallas yet in the world of fiction. 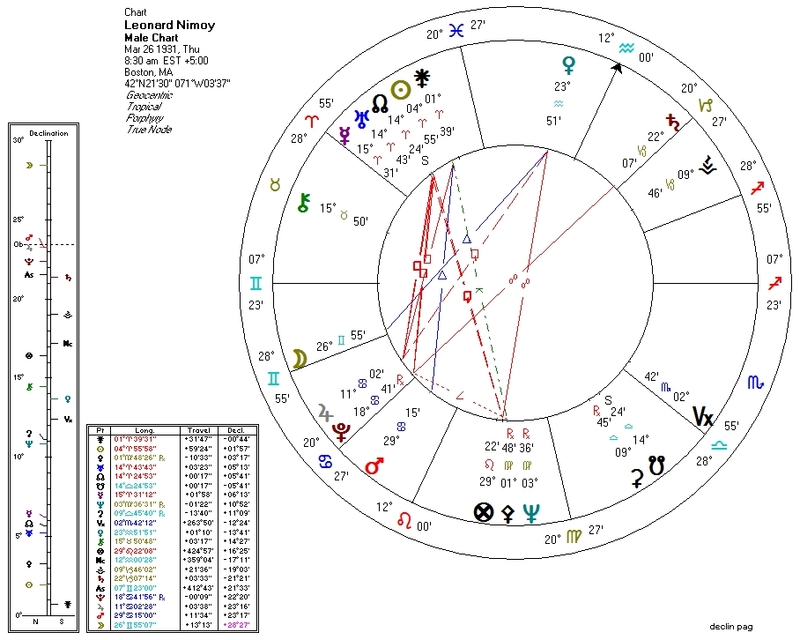 Here is a birth chart for Leonard Nimoy, the actor whose life's work has been the portrayal of Spock. Very few remember his other endeavors, including musical albums and a stint on "Mission: Impossible". He not only performed the Spock character but originated a few of his signature traits including the "Vulcan nerve pinch". As we would expect from a man who brought a completely Palladian character to life for an audience of millions, Pallas is quite strong in the chart. Pallas is conjunct Neptune (common in artists, religious leaders, and persons capable of generating a powerful personal mystique), quincunx the Sun, and sesquiquadrate and ruled by Mercury with the North Node. Pallas is strong when in connection with the Sun, Mercury, and/or the North Node; here we have all three. The "birth" or first broadcast chart for Star Trek itself fittingly boasts Pallas rising, contraparallel Sun. The Star Trek Planetary Confederation itself would have to be some relatively benign (and probably impossible) form of fascism. 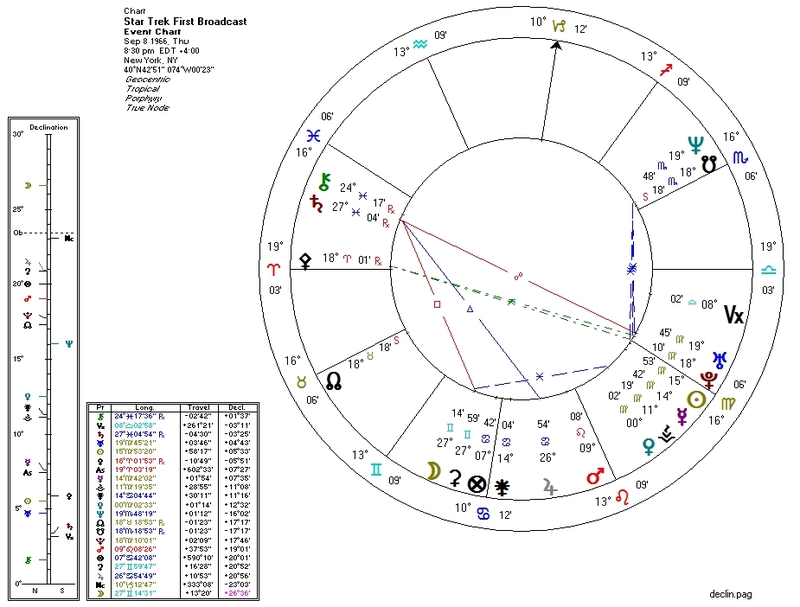 This is also on the chart, with the prominent Pallas weakened by a yod with the South Node and Pluto (suggesting a central authoritarian government, as in the background of the show). The North Node is in the Second House: capitalism (perhaps obviated by "replicator" tech). Jupiter is in the 4th House, perhaps suggesting openness to other races and cultures.